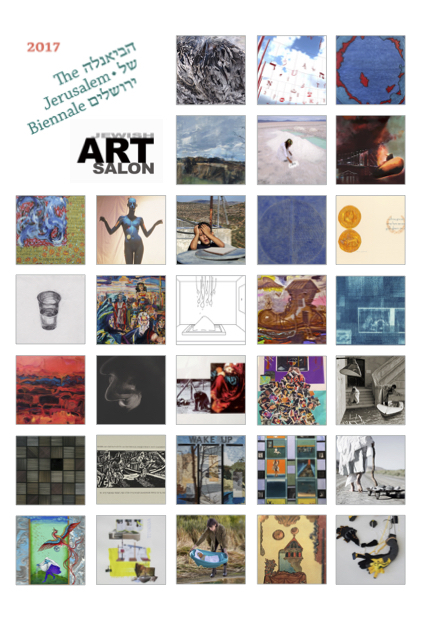 The Jewish Art Salon has been selected to exhibit at the 3rd Jerusalem Biennale for Contemporary Jewish Art, which will showcase the work of nearly 200 professional artists, Israeli and international, in dozens of exhibitions and installations. The Jerusalem Biennale, which explores the intersection between contemporary art and the Jewish world of content, took the concept of Watershed as its theme. 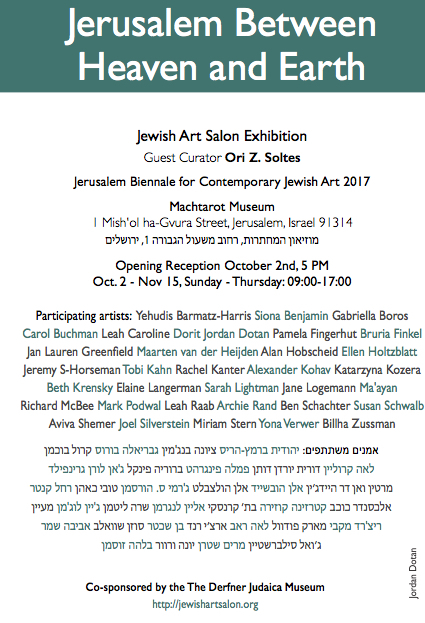 The Salon’s “Jerusalem Between Heaven and Earth” was curated by Ori Z. Soltes, and will be on view from October 1 – November 15, 2017. Opening reception October 2, 2017 at 5 pm. Hours: Oct. 2 – Nov. 15, Sunday – Thursday 09:00-17:00. Jerusalem Biennale Founder Rami Ozeri: “The Jerusalem Biennale provides a stage for professional artists – from secular to ultra-Orthodox – who refer in their artwork to Jewish thought, spirit, tradition or experience. The Biennale will throw the spotlight onto the concept of watershed, examining it from a literal, metaphorical and even historical perspective. The theme finds its expression in issues as varied as Jewish identity, immigration and refugees, alongside watershed moments in history. Co-sponsored by the Derfner Museum, Riverdale, NY. The idea of a watershed suggests a branching, be it of physical terrain, historical events or spiritual and aesthetic concepts. This notion is particularly powerful in conjunction with Jerusalem. The exhibit arc encompasses multiple divergences that begin with and come back to the geological topography of the Sacred City. That topography—an outcropping of land from the Judaean plain, surrounded by valleys on three sides, offers a symbolic statement of how the spiritual foundations of Jerusalem branch in three Abrahamic directions, and how multiple spiritual ramifications have flowed in diverse aesthetic and political streams. From beneath the surface, they periodically surge up into our consciousness. Tobi Kahn’s uniquely sculptural paintings and Leah Caroline and Jeremy S-Horseman’s water-based sound-centered installation offer, as a beginning point, abstract suggestions of the geological watershed that helps define Jerusalem. The Sacred City’s topography made it both difficult for King David to conquer and, when he did so by way of its singular underground water source, he made it his political and spiritual capital. Jerusalem became the basis for much of Israelite-Judaean history and for Jewish, Christian and Muslim fantasy, and remains a centerpiece of contention in the politicized Israeli-Palestinian world of today. The idea of the city pre-dates the city’s role in that history. The real—spiritual—beginning of the journey toward David’s unification and Jerusalem as a capital is found in watershed moments in Exodus when a loose confederation of tribes embraced a stringent divinely-mandated covenant. Joel Silverstein’s sweeping epic painting suggests the pre-moment that pushes the Israelites toward Sinai and thence toward Jerusalem, the city in which the Shekhinah has for so long been felt by many to reside—and which has, in modernity, sometimes become a comic-book version of itself. Richard McBee’s dramatic painting submerges the plague-induced moments that gradually separated the Israelites from Egypt within a framework—conceived as two doors—that suggest the very portals into the Holy of Holies of the Temple in a watershed construction that will eventuate half a millennium after the plagues. For the Israelite evolution yields to David’s son, Solomon, the structure that he built and the wisdom with which he became associated—so that the Book of Kohelet, as explored by Ellen Holtzblatt’s paintings, is traditionally ascribed to him. Gabriella Boros considers watershed warnings to the Israelite-Judaeans articulated by Isaiah. Jerusalem is both particular and universal—and the message of the biblical book of Jonah, a dramatically different focus of Yona Verwer and Katarzyna Kozera, Jan Lauren Greenfield and Alan Hobscheid, emphasizes the watershed outreach of prophecy beyond the city of prophets as far as Nineveh—capital of the Assyrian enemies of Israel. The outcome of this series of divergences for the multi-valent city’s place in and between worlds is four-fold. One, within the Jewish tradition, the biblical has given way to the rabbinic and its penchant for midrash—encountered through Rachel Kanter’s fiber, “Wake Up,” and Beth Krensky’s video, Tashlich. Ben Shachter’s “Aquavit: Praying for Rain” furthers the rabbinic by re-visioning the concept of the mikveh. The rabbinic has in turn ramified toward the mystical, as in Susan Schwalb’s small, tight abstract visualization of the concept, Lamed-Vav, and Alex Shalom Kohav’s installation, “A/Dam,” that interrogates the relationship between humans and the divine, of which Jerusalem has been an enduring symbol. In Carol Buchman’s haunting work the mystical and geological become panhenotheistic: the Name of God suffuses nature at its most extreme; the artist functions as priestly intermediator. Two: away from Jerusalem, Jewish history and thought have constantly sought a spiritual and, ultimately, physical return to Jerusalem—with particular vehemence at the harshest watershed moments in the diaspora experience. Mark Podwal conceptualizes the Expulsion of 1492 in his unique style; Billha Zussman imagines how that external watershed has internal consequences in her “Espinoza: Marrano of Reason;” Archie Rand and Maarten van der Heijden offer cutting edge—watershed—visual references to the Shoah. Three: Jerusalem reaches and branches into Islam and Christianity—converging with and diverging from the city’s Jewish emphases. Siona Benjamin’s painting considers how PaRDeS (as a Jewish, and particularly a Jewish mystical concept) intersects the Islamic concept of Jannat. Miriam Stern re-visions the lushly colored Christian vision explored in the Crusader Bible. Four: the watershed of Jerusalem turns inward: Sarah Lightman and Ma’ayan each turn the topography of Jerusalem toward profound life watersheds regarding people and the very making of art. The watershed of return to Jerusalem and the questions of Jewish-Christian-Muslim coexistence within Jewishly-governed modern Israel begin to bring this exhibition arc back toward its earthbound beginnings. The ramifications are multiple. Aviva Shemer’s installation of suspended Hebrew, Arabic and Aramaic letters is inspired by Martin Buber’s discussion of Jerusalem as a center of the Am Olam a century ago; Jane Logemann’s “Co-Existence”—frenetically repeated (like a cross between Philip Glass music and Abulafian mysticism) in Hebrew and Arabic—turns words into abstract images. Leah Raab’s depiction of the “Valley of Tears” alludes to a specific time and place within the Yom Kippur War. Dorit Jordan Dotan’s “A Drop in the Bucket” focuses on the crisis of Israeli-Palestinian water-sharing. Bruria Finkel’s “Salt Mound” installation turns the issue of potable and salt water convergences back toward the geology of Jerusalem. Yehudis Barmatz-Harris’ video turns water to fire in pushing history backwards: from the crucible of Jerusalem’s return to Jewish hands through the Shoah and the connotations of fire in Hassidic mystical thought to the book-burnings of diaspora experience and the burning of the Second and First Temples to the purification process of the Israelites in the wilderness by means of the burning of Red Heifer. Pamela Fingerhut’s digital image of Miriam and Baby Moses returns us to the biblical moment of Moses’ birth through a modern Middle Eastern lens. Elaine Langerman’s small, colorful painting, interwoven with text, entitled “Poem #1: Watershed” concludes the return to the topographic ground of the exhibition inquiry. Text as the basis for Jewish ethos ramifies to the visual imagery that define Jewish art—and raises the questions: what is Jewish art? And what is Judaism within itself and within the world? Both “Jewish art” and Judaism are suffused by questions—like the city of Jerusalem itself.